In a medium bowl, mix the cream cheese, Worcestershire sauce and hot pepper sauce. Spread the mixture on a medium serving platter. Top with cocktail sauce, and layer with shrimp. 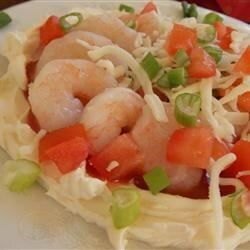 Cover the shrimp with green onions, tomato and mozzarella cheese. Crisp and cheesy shrimp party appetizers! Definately a keeper, however found the frozen baby shrimp to be tastier for this recipe instead of the canned. (Less of a fishy taste). Very good though!